Guide in 'Disciples of Magic' published by Ivy, Jul 27, 2015. This is a rundown of the AST class and what to expect with it. 1) What is an Astrologian (AST)? An AST is a new healer class introduced in 3.0, or Heavensward. It is a utility/support based healer that has overall less potent heals than its cohealers (White Mage and Scholar). However, the class has the abilities to buff up its party with cards, which makes up for its lack of healing capabilites. AST is also one of three current jobs that does not have to be leveled from level 1. Upon unlocking AST, you automatically get your soul crystal and are level 30. This class might be harder for people who are new to healing to pick up, and if you happen to forget your cards occasionally, don't fret! It's a fun class to learn how to play, but it takes time to master it, especially with the lower heal potencies. If you can overheal to compensate for the slight potency issue, this class can still be utilized to be an extremely powerful support healer. To better understand AST, you must look at its skills. Do note that when you unlock AST, you will have all 1-30 skills. It might be a little overwhelming, but make sure to read them all! Please note that you cannot change Sects in combat. Increases cast time by 5% while adding a Regen effect to certain spells. Increases healing potency by 5% while adding a shield to certain spells. This is your main attack until you get Malefic II. If you can pop into Cleric Stance, put up Combust and then go to town with Malefic. Your basic heal, which you will be using even in 60 content. At later levels, this will proc an Enhanced Benefic II, which will make your next Benefic II an instant cast. This is an instant cast Damage-Over-Time (DoT) that does damage for 18 seconds. You want to throw this onto a mob and then use Malefic until Combust nearly falls off. This is your raise. If someone dies, you can, of course, use this to raise them. This removes one detrimental effect from your target. For example, if your tank is poisoned or paralyzed, use this on them to get rid of it. Stella is a damage spell that also applies Heavy. Due to having less potency than Malefic, Stella is not too useful outside of content where you may need to Heavy enemies. If your Benefics aren't cutting it, feel free to use Benefic II. This heals for significantly more than Benefic, but also costs more MP. Stance introduction! Depending on your stance, Aspected Benefic can do two things. Diurnal Sect: 190 Potency, this is an instant heal that also gives the party member an 18 second regen. Nocturnal Sect: 250 Potency, this gives the party member a shield. This is the Area-of-Effect (AoE) version of Aspected Benefic. Combust II has to be cast, unlike Combust. Aside from that small difference, it also lasts for 30 seconds instead of 18. Throw this on, then Combust, then Malefic away. This is your AoE. Use this sparingly, as it costs a LOT of MP! This will replace Malefic when you unlock it, unless you are doing lower level content. Draw a card from your deck. Depending on the card, each has difference effects. The Balance: Increases target's damage dealt by 10%. Duration: 15 seconds. This skill returns the card you drew back to your deck, but enhances the next card you draw. Please note that you can click off your Royal Road if you happen to dislike the card you drew paired with it. For example, if I have an Expanded Royal Road and draw The Bole, I would be more inclined to click off my Royal Road and use The Bole on the tank, unless significant raid damage is happening. Holds the card so that you can use it at a later time. Returns the card you drew back to your deck for a new one. Can still draw the card you tried to Shuffle back into your deck. Reduces cooldown of spells by 2.5s as well as the magic potency by 50% on offensive spells (Combust, Malefic, etc) and the cost of spells by 25%. This is still useful for healing since the reduction only affects your attacks. If you're in a pinch or need to conserve MP, popping Lightspeed is always a viable option. Reduces enmity while replenishing your MP. I personally use this when I hit around 9K MP at level 60. This has a Cure Potency of 400. However, the lower the target's HP is, the higher the potency becomes, and it can crit. This is your “Oh s**t” button; I wouldn't advise using this freely because you might really need it later. Disable reduces the damage of the next skill used by your target by 10%. It works on auto attacks as well, so misused, it can go to waste. I use this when the target is casting something unavoidable, as it will work even if the target is already casting. Misleading translation. This extends beneficial effects you put on the target by 15 seconds. For example, if I have a tank with a Diurnal Sect Aspected Benefic, Aspected Helios, and The Bole on him, and use this cooldown, all of these effects will be extended. In all honesty, this is arguably a useless skill. It makes a bubble for 18 seconds. Nocturnal Sect: Damage taken reduced by 10%. The problem with Collective Unconscious is that you cannot move or cast while channeling this bubble. In Nocturnal Sect, it has some uses, but I hardly use it in Diurnal, if at all. Stuns all enemies and extends the duration of beneficial effects you put on targets and yourself by 5 seconds. Works with Luminiferous Aether and Lightspeed! I use this to extend my raidwide The Balances, or extend my Luminiferous Aether if I happen to really need MP at the time. This should be your first cross class. Any time you do 4 man content, put Protect on the party first. Your “attack” stance. Use it whenever you can help DPS. Please note that it lowers your cure potencies! Unlike Combust and Combust II, Aero hits the target with some damage, and then acts as a DoT. The DoT potency is 25 for 18 seconds. Prevents physical damage totaling 10% of the target's max HP. I recommend getting Stoneskin just in case. If you are healing with a Scholar and neither of you have Stoneskin, it can be a pain. Absolutely essential for a healer. This makes your next spell instant, and is a life saver for when you have to raise people. If you're looking to understand AST, I can sum up the class easily for you: card usage is the most important skill to learn. For each circumstance, there may be a card you want to hold onto. I'm going to go through basic content and raid content alike to give some examples of how to better judge on an AST. If you are running something for the first time that is an Extreme Primal or raid, I highly recommend looking up a guide. It will help you, as an AST, understand a few important parts of the fight, mainly two big ones: DPS checks and raidwide damage. So, what defines a DPS check? I'll throw out a few examples. In Ifrit Normal Mode and the nail he spawns. If that nail does not die fast enough, he will wipe the party. This is another DPS check. An endgame example of this would be Ravana Extreme, where he enters his "Warlord Shell" phase. You have roughly ~20 seconds to break this shell or he will wipe the raid. Raidwide damage tends to be one hit that is massive. An example is in Final Coil of Bahamut Turn 11, when the boss casts Nerve Cloud. There are also various bosses you will run into in dungeons that have raidwide damage, one dungeon example being Stone Vigil's second boss and third boss. Normally, raidwide damage moves have a cast bar, so learn when they're coming this way. Another version of raidwide damage is periodic damage, whether through damage over time or hits that hit harder the longer the phase takes. Two examples here would be Aurum Vale's first and third boss, which do raidwide damage over time that should not be immediately cleansed with Morbol Fruit. Another example is Final Coil of Bahamut Turn 12, during the add phase. The boss will be casting Flames of Rebirth during this time and every time it gets a cast off and an add is still alive, the next rebirth will be that much stronger. Now that I have these two mechanics explained and endgame and leveling examples, let's talk about using The Balance and The Bole effectively. If you are about to go into a phase where The Balance or The Bole will be effective, it is best to hold the card, especially if you have Shuffle available to try and get an expanded The Bole or The Balance. If you have no ways to get an expanded card, give The Balance to your best DPS. Coordinating with your team is key, especially if you have voice communications to do so. A big thing to note is that Lightspeed + Stoneskin is very useful! It's effectively your Presence of Mind and Stoneskin casting. If a big hit is coming up, and you cannot get a raidwide The Bole, you can at least pop Lightspeed and Stoneskin your team and Disable the boss's big attack. Lightspeed does not affect Stoneskin, so this is still a solid way to mitigate damage. Of course, introducing this class as the less potent healer would deter people from it. I will be blunt and say I do not believe AST is a good class for people to pick up for their first time healing, as it requires you focusing and using things off of cooldowns immediately. However, in a competent person's hands, it can be put to use, and possibly be put on par with a good White Mage or Scholar. Looking at each healer, you will notice White Mage is a reactive healer. They react while things are happening, and heal as the hits are taken. Scholar is proactive with its shields and will shield before a big attack, generally speaking. AST brings a new kind of healer to the table, which is a utility healer. I personally play my AST in a reactive way and am always in Diurnal. I have yet to have a problem, and I believe the class can be quite viable with its cards. I have solo healed Ravana EX as an AST and it was a breeze. I wouldn't be deterred from the class just because of these assumptions. DISCLAIMER: This is what I personally do. I do not parse in game during dungeons, so I will assume DPS are either on equal terms or look at the aggro meters as a rough estimate of how they are doing. With your cards, it's hard to understand who might need what. So, let's go over your options. The Balance: I personally use this on the DPS highest on the aggro chart in your party list. If you look at the party, you will notice “A” is the tank, followed by “2” “3” “4” etc. These numbers rank how much aggro generation you are pulling. In this case, I would put it on the DPS who is the highest number in terms of the aggro chart. This is not sound, because some classes have enmity reducers, but it gets the job done. The Arrow: Black Mages, Summoners, Bards with Wanderer's Minuet on, and Machinists with Gauss Barrel on can make use of this card. I do not recommend giving The Arrow to Monks or Ninjas. This reduces their global cooldown to such a ridiculous amount that they will run TP dry insanely fast. It's okay for Dragoons, but the classes I listed should be prioritized, as they all have cast bars. The Ewer: Give this to yourself, a Summoner, or your cohealer if they are struggling. Never give this a Black Mage if you can help it, short of expanding The Ewer. Black Mage rotations rely on MP ticks, and The Ewer can throw it off rather easily. The Spire: This can go to your tanks in most situations, as they all use TP, and have the most issues with regaining TP short of having a Ninja in the party to Goad them, or if a Warrior in Deliverance (their "DPS" stance) and uses Equilibrium. I normally give this to my Warrior regardless when I'm raiding. The Bole: This should, of course, always be used on your tanks, unless a big hit is coming up and you know it. If a big hit is coming up but you have time to Spread The Bole and try and draw The Spire or The Ewer to Royal Road, I would recommend doing so. Otherwise, like I said, give this to your tank. The Spear: Royal Road fodder. I say this lovingly as this card, while great, is often very misused by people. I will pay attention to my DPS's buffs and use this on the DPS who has not popped their offensive cooldowns in hopes that they do. If I need MP, I use it on myself and then pop Luminiferous Aether. 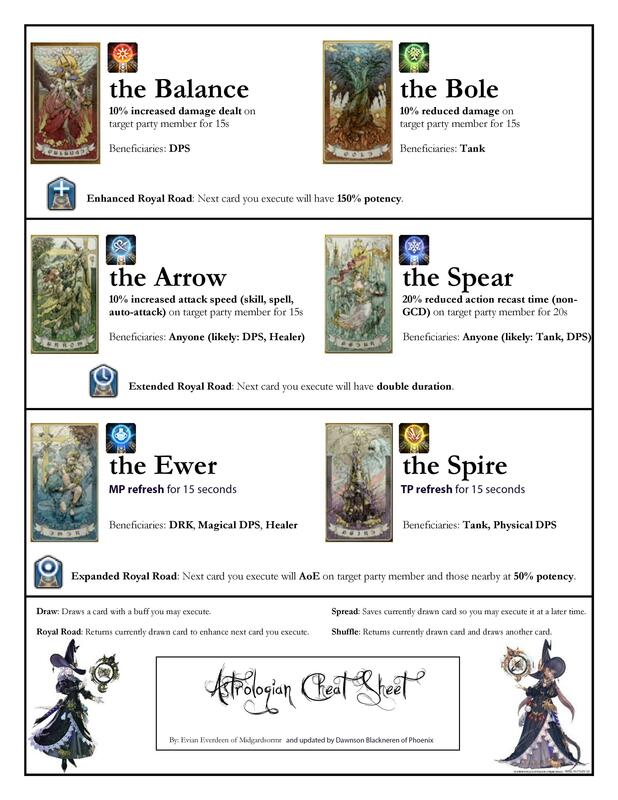 If I draw The Spear and I do not need MP, and buffs have been popped, I will almost always Royal Road it. Scholar and Summoner can make use of The Spear in a different way, however; if given this card and they use Aetherflow afterwards, Aetherflow has a cooldown shorter than 60 seconds. Pay attention to your Scholar or Summoner's stacks if you can in that case. DISCLAIMER: This is my personal opinion on these two stances. I'm sure some people disagree, so it's best to experiment yourself and decide what one you like more. I have yet to really use Nocturnal, unless I have an AST in the party with me and they are in Diurnal. I do not find the stance useful, and honestly, it's very lackluster in comparison to Diurnal's regen. I have met some ASTs who prefer Nocturnal, but due to my healing partner in raids being a Scholar, I already have a much more potent shield with me to begin with. Even when paired with a White Mage in content, I tend to use Diurnal, because our regens stack with Medica II and Regen, and it feels good to watch people be healed for 3,000 a tick from the massive amount of HP over time. However, just because I prefer Diurnal does not mean that you shouldn't try Nocturnal. Perhaps you enjoy the feel of it more, and if you do, I encourage you to keep using the stance that you are most comfortable with. Until it causes a genuine problem somewhere down the line, there's no issue in using one or the other. Astrologian: If you are running content and have double AST, see what stance the other one is in. AST regens do not stack, so if you are both in Diurnal stance, it's best for one of you to swap. The same goes with Nocturnal shields – they also do not stack. Don't be afraid to ask, and if you are completely unsure, take off both stances and wait for the pull, because you can apply a stance in combat. You just can't switch in between them during combat. Scholar: I prefer Diurnal when with a Scholar, as pointed out before. Their shields double in potency if they crit, which is something the AST Nocturnal shields lack. It's better to have the regens ready for the party over trying to stack less potent shields with a Scholar's, especially when the Scholar is using Selene and does not have Eos for the Whispering Dawn regen. White Mage: I will still, personally, stay in Diurnal stance in this case. As pointed out before, all of our regens stack, and can do a massive amount if the White Mage happens to have Divine Seal popped. However, in this case, either stance works for White Mage, so go with the one that you prefer the most. There is no “wrong” with a White Mage cohealer. Gear is, for all intents and purposes, very opinion based. If you asked me how I play my AST, my response would be simple: I play it with Critical Hit Rate and Spell Speed if I can. The optimal gear for an AST cannot be decided, unless you are playing in Nocturnal Stance, where Critical Hit Rate is almost always preferred due to crit shields (they may not double in potency like they do for Scholar, but it's still useful). When I am able to play my AST with a Crit+Det build, I will decide whether or not it's worth the time, as Diurnal Sect speeds up cast time and could make this sort of build worthwhile in the end. Lunaix, nobopyon, Anvi S. and 6 others like this.